Lawn winterization is an important part of lawn care, especially for cool season grasses. Warm season grasses can be winterized, but not in the traditional sense. Unfortunately, many lawn fertilizer companies offer a "one lawn winterizing formula for all grasses" solution that can actually harm some grass species. Here is a quick look at how the two major grass groups and how they should be winterized. Cool Season Grasses- Apply a traditional lawn winterization fertilizer beginning in late summer through late fall. The nitrogen can be applied in two applications. The first at the end of summer and a second one at mid to late fall. Warm Season Grasses- Traditional lawn winterization is not recommended. Instead, you can apply a potash (K₂0) fertilizer containing low amounts of nitrogen with higher amounts of Potassium. Potash is the usual form of Potassium used in fertilizers. This is explained in greater detail below. Below is a detailed description of how lawns should be winterized. Cool season lawn grasses consist primarily of Fescues, Bluegrasses, Ryegrasses, and Bentgrasses, Some cool season forage grasses include Timothy, Brome, and Orchard grass. These grasses grow best in 65 to 75 degree temperatures. They maintain a shade of green color well into the winter and may only loose their color during periods of extreme cold. In the U.S., these grasses grow best in the northern two thirds of the country. They are also found throughout Canada, many European countries and other cool weather countries. They don’t do well in high heat, so in summer, adequate moisture is needed to keep the grass from going dormant. In warmer climates, annual ryegrass is often used to overseed warm season grasses in winter to maintain some green color. Cool season grasses grow differently than their warm season cousins. The majority of their annual nutrients are taken in during the fall months making lawn winterization very important. In the fall, cool season grasses are taking on large amounts of nutrients to over come summer stress and to get them through the winter. In addition, these grasses are programmed to use stored nutrients to break winter dormancy in spring. Most people are not aware that as much as seventy-five percent of the total annual nitrogen requirement is obtained in the fall. Therefore, fall lawn winterization is the best way to deliver the needed nutrients to your grass. This is best accomplished with two fall applications. The first in early fall and the second near the last cutting of the year in late fall. Cool weather grasses will continue to take in and store nutrients far after the last cutting and well into the winter. In late season, even when the grass has stopped growing new leaf tissue, it is still very active. In fact, uptake of nutrients will continue until the soil temperatures dip into the mid-thirties. You can still use weed control products and fall pre-emergents at the same time as winterizing your lawn. As a side note: Just be aware that many spring weeds actually germinate in the fall and over-winter as seedlings before finishing their growth in the spring. To stop the spring broadleaf weed growth, you will need to add a pre-emergent or be prepared to use a broadleaf herbicide in the spring. The pre-emergent must go down before the weed seeds germinate to be effective. The first application should be applied at the end of summer/beginning of fall. The temperatures should have fallen from the heat of summer and at the very most in the low eighties with night temperatures being much cooler. The second application should be applied as growth slows down considerably or a couple months after the first winterizing application. The leaves on the trees should be in full fall color or close to it. Even after the leaves have fallen is not too late since the grass is still taking on nutrients. First application: 1/2 to 3/4 of a pound of nitrogen per 1000 sq. ft.
Second application: One pound of nitrogen per 1000 sq. ft. The exception is for fine fescue which only needs a third of the nutrients of other cool season grasses. Go lighter on fine fescue. If you need more help with lawn winterization or developing a complete fertility program, be sure to visit the page on Developing a Fertilization Program. Warm season lawn grasses include Bahaigrass,Bermudagrass, Buffalograss, St. Augustinegrass, Centipedegrass, Zoysiagrass, and others. Most grow best in southern locations with mild winters and hot summer temperatures. Although they perform best in 80 to 95 degree temperatures, they can easily endure much higher temperatures with adequate moisture. However, it can benefit from an application of (K) potassium, especially of a soil test indicates the soil (K) is low. Potassium in fertilizer is generally Oxide of Potassium, also called Potash (K₂0). Unless you live in a tropical region, warm season grasses go dormant as temperatures drop in the fall. Once the grass is dormant, activity in the plants completely stop and will not resume again until spring as soil temperatures begin to warm up again. Spring Dead Spot and other Lawn Diseases. Late summer applications of Potassium (K), (the third number on the bag of fertilizer) has shown to be beneficial. 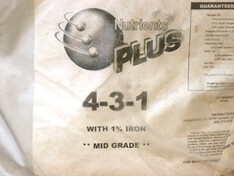 The fertilizer should be low in nitrogen or have a 0 as the first number on the bag. Benefits of Potassium include enhanced disease suppression, stress relief, including cold winter stress, as well as performing other functions within the plant. It is best to conduct a soil test so you know exactly how much Potassium is already present. If the results of your soil test indicate low potassium levels, it is safe to apply up to 1 lb of K in an application. Click here for more help Calculating Fertilizer Rates Easily and Accurately. Also, soil analysis reports can be difficult to understand. Click here for a detailed explanation of a Soil Analysis Report. The fertilizer you use should be low in Nitrogen. An example could be fertilizer with an analysis of 4-3-20 or 0-0-18. Notice that the last number on the bag indicates the Potassium. If you have had problems with spring diseases, it is recommended by many leading turf professionals that an application of one pound of Potassium with little or no nitrogen be applied per 1000 sq. ft. even if the soil test indicates adequate levels of K.
Be aware that higher levels of Potassium can burn your grass due to the salt content. It should be applied to dry grass and watered in thoroughly after application to wash granules from the grass blades. While all natural organic fertilizers have grown in popularity, few people really understand how they work. They are very safe, they are not always the best choice as a lawn winterizer. Most natural organic products have a nitrogen content that is too low. Although the nitrogen content of different organic materials varies considerably, the majority simply cannot deliver the recommended amount of nitrogen needed for lawn winterization of cool season grasses. Compounded this with an even slower release rate in fall only makes it worse. The Nutrients Plus organic fertilizer at the right is an excellent summer fertilizer, but will not provide the needed nutrients for fall lawn winterization. Nutrients Plus does make an excellent fall fertilizer. The release of nutrients from some organics is extremely slow in even the best of conditions. It will always be slower in the cooler weather of fall. Why? Most organics are dependent on soil microorganisms to release their nutrients. Since the activity of soil microorganisms slows as temperatures fall, the process will becomes much slower in the fall. These are the types most often used by professionals. Most of the homeowner varieties that are sold at lawn and garden stores will be in a similar form. Organics blended with synthetic forms of nitrogen (called “bridge” products) are probably the best choice. They will contain a fair amount of organic material fortified with higher amounts of nitrogen. They are formulated to meet the needs of your specific grass type. They generally contain several forms of nitrogen in both quick release and slow release form. They are also very safe when used correctly. Organic and Non-Organic Nitrogen Sources, click on the link. The quick release nitrogen becomes available immediately after application and will continue to release for a couple weeks. The slow release nitrogen (i.e., sulfur coated urea, poly-coated urea, and others) will begin releasing nutrients several days after application as the outer coating is broken down. Moisture is needed to breakdown the outer coating. This provides a steady release of nitrogen for an extended period of time. Different coatings offer different release rates, so look for bags that contain more than one form of slow release nitrogen. These are usually the least expensive fertilizers sometimes selling for less than 10 dollars for a 50 lb bag. Many homeowners apply this type simply because they are cheap. The 50 lb bags sold at my local feed store have no instructions for use or information on how much to apply leaving the homeowner to guess at the application rate. These fertilizers serve a purpose in the turf industry, but require knowledge and skill to use them properly. The ingredients of most all non-coated mineral fertilizers release at the same time a soon as water is applied. In addition, they have a very high salt content and must be watered in thoroughly after applcation to avoid burning the grass. When used improperly or in excessive amounts, the majority of the nutrients can quickly leach below the root zone and will no longer be available to the grass. Excessive watering or heavy rain only quickens the rate of leaching. If used in small amounts of about a quarter pound of nitrogen per application spaced a couple weeks apart, it should do fine. However, it is much easier and less work to apply a fertilizer designed for lawn winterization. To help save money, can I use left my over spring fertilizer for fall lawn winterization? For warm season grasses, the answer is no. It will generally contain too much nitrogen for that late in the season. Skip the application or purchase a fertilizer containing low nitrogen with about 15 percent Potassium. For lawn winterization of cool season grasses, the answer is yes and no. A complete answer requires a little understanding of spring fertilizers. Some spring fertilizers sold for homeowner use actually contain too much nitrogen for cool season grasses in spring. Why? Fertilizers companies know that the average homeowner is likely to apply fertilizer once a year during the spring. So the companies will cater to what the homeowner expects to see in their grass rather than what it actually needs. In spring, the grass only needs about .5 to .75 lbs of nitrogen per 1000. However, it is common to see spring fertilizers with a nitrogen analysis of 25 to 35 or more and with an application rate of 1.5 lbs of nitrogen per 1000 sq. ft. 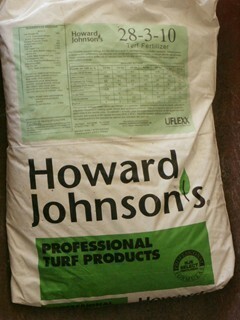 It is true that this provides a deep green and fast growth, but it is at the expense of grass health. A well developed fertility program will apply far less nitrogen than what is often recommended for homeowners in spring. However, that can be a great amount of nitrogen for fall lawn winterization. Consider, however, that spring fertilizers usually contain a lot more quick release nitrogen than fall fertilizers, so wait until the weather is consistently in the 70’s or lower before using. For best results, your lawn fertilizer should contain less than 50 percent fast release or you will lose a lot to leaching. Second thing to consider. Are you planning to overseed in the fall? If you are planning to overseed or have already done so, make sure the spring fertilizer you are considering for lawn winterization doesn’t contain any crabgrass or other weed seed preemergence or it will likely prevent your grass seed from germinating. Detailed information of popular cool season grasses in the U.S. Everything you need to know including the pros and cons, maintenance tips, and insect and disease problems. Detailed information on popular warm season grasses. Which one is right for you, pros and cons, and tips on how to care for each one. One of the tough parts about fertilizing is knowing how much to put down. This page gives you simple mathematical formulas for determining the correct amounts in different situations. Do you know what the numbers on a bag of fertilizer mean? This page will show you a detailed description of what is in fertilizer and the different types that are available.